The destruction of Pompeii and the unique remains left behind have long fascinated me. Just looking at the well preserved plaster casts of those caught in the eruption is heartbreaking and provocative. But while archaeologists and scientists might be able to extrapolate facts surrounding the eruption of Vesuvius in 79 CE by what remains there seems to be very little remaining that can speak first hand to what these people felt leading up to, during and directly after the catastrophe. What would it have felt like to stumble through the streets in daytime darkness and booming explosions while rocks and ash rained down on you without knowing what was happening or what was coming? What would you be thinking as your world literally came crashing down around you? Vicky Alvear Shecter's Curses and Smoke showcases this emotional, humanistic side of living during this time and through this devastating event from the viewpoint of two young lovers desperately searching for freedom in a world not ready to give it to them. Both Tag and Lucia are very sympathetic, well developed characters and while the extensive and very informative author notes at the back of the book indicates that most of the characters, including Tag and Lucia, are fictional the descriptions of their struggles and the heart and soul they display make them feel all too real. Being that this is a YA novel described as targeting readers aged twelve and up, their fight for the right to make their own choices and decide their future will feel all too familiar to those going through that transition from child to adult. Reading about how little freedom these two had and how powerless slaves and women were during this time should also highlight how different life is now and how much more freedom is inherent in our modern society. This in no way limits the enjoyment for older readers as anyone can relate to what it feels like to lose control and struggle to grasp what you can. Regardless of age, gender or circumstances, it isn't hard to feel compassion for these two and cheer them on as they try for the seemingly impossible. My favorite character of all, however, was young, orphaned Castor, who follows Tag around like an energetic and loving puppy, pulling on heartstrings and just begging to be loved. These three characters are the stars of the novel and I can honestly say by the end of the book I was completely invested in what happened to them. The only character that left me scratching my head was Quintus, the self-centered patrician who tried to come between Tag and Lucia. He seemed to be attracted to Tag but then would treat Tag like a lowly servant and do things to demean him. He would often tell Tag he wasn't as bad as Tag thought but then would be just as self-centered and nasty as you could imagine. While other characters, such as Lucia's horrible and cruel father, aren't likeable they still play an integral part in the overall story and by the end Quintus just didn't seem to have done that. That being said he didn't necessarily detract from the story either and so just felt unneeded to me. One of my favorite aspects of the novel, besides the wonderful characters, was discovering the differences in religion, superstition, and cultural practices that were new to me. I was not aware of the Roman conquest of Pompeii and what that meant for the Etruscan people who lost their way of life and, for some, their freedom when they became slaves to the Romans. For that matter I wasn't aware of just how prevalent and accepted slavery was during this time. Another horrific discovery was the practice of exposing unwanted babies to the elements by being left to die outside the city. Just the thought of those poor babies being left to die and the complete inability of the mothers to do anything about it if their husbands refused to accept them just turns my stomach. These very different practices, regardless of how unsavory or foreign to our modern minds, are all integral parts of the story and give the drive needed for the characters to react and strike out at the world as they do. It really is fascinating to learn what people from history had to deal with and what they did to fight against the injustices that we often take for granted. In regards to this being a YA novel I also enjoyed that the romance aspect felt very age appropriate. It was sweet, tender and confusing at times, just as first love should be. I think anything more heavy-handed would have felt inappropriate given the younger end of the spectrum of readers and makes it easier to recommend this to a wider audience. It should be noted that not all elements of the novel are easy to read and the ending, while breathtaking, might catch readers by surprise and not necessarily in a good way. It, like the life the characters are living, isn't always perfect or happy and really drives homes that fighting for something like freedom often comes with devastating consequences. With all this considered, Curses and Smoke is a remarkable novel that I don't doubt will spur on its readers to look further into this time and place in history. I know it has done that for me. So What Did I Think About The Cover? Absolutely beautiful! I love the wispy, innocent looking young woman in the front staring at the angry, red volcano in the distance. The explosion is such a turning point in the novel that the cover makes me think of that split second in time before all hell breaks loose! It fits the feel of the novel perfectly for me. 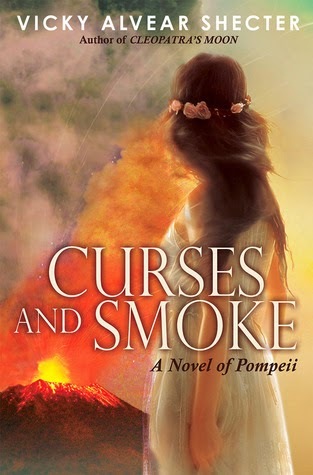 To enter to win a copy of Curses and Smoke of your very own tell me below if you have read any remarkable novels that take place in Ancient Italy and be sure to leave your email address (no email address, no entry). For extra entries share online and leave a link to where you shared. I will randomly pick a winner on June 17th and the winner will have 48 hours to respond to my email before I have to pick another winner. Good luck! You can also find the links to purchase the book and follow along with the book tour below. Vicky Alvear Shecter is the author of the young adult novel, CLEOPATRA’S MOON (Arthur A. Levine Books/Scholastic, 2011), based on the life of Cleopatra’s only daughter. She is also the author of two award-winning biographies for kids on Alexander the Great and Cleopatra. 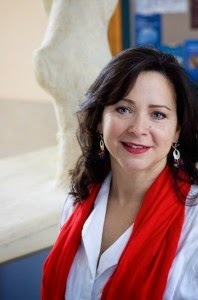 She is a docent at the Michael C. Carlos Museum of Antiquities at Emory University in Atlanta. Sarah Dunant's books are also very good. I don't think I have read any of her books yet, although I have heard the name so she must be one of those historical fiction writers that everyone loves that I seem to have missed along the way :). I will check her out! I have not read any novels from ancient Italy. I've been reading the four-book series on early Rome by M C Scott, set in the first century, certainly not YA, but an interesting series. I've now become a devoted fan of this era and this setting. Thanks for the giveaway. I haven't read those, Linda! I will need to check the series out...I LOVE a good, juicy series to follow! Thanks for the recommendation! I still love I, Claudius!!!! You know, I am a little embarrassed to say I have never read I, Claudius (I know, I know, bad me). It is on my wish list though! I'm not sure I've read many on ancient Italy. Does Pilate's Wife by Antoinette May count? 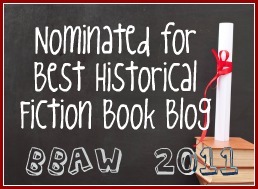 What about The Confessions of Catherine de Medici by C.W. Gortner? I'm sharing this one my Contests and Freebies page. The Titus Pullus series by RW Peake! Love, love, love!!! and books by Colleen McCullough (her series on Caesar and Cleopatra). Thank you for the giveaway. I was a volunteer at the Pompeii exhibit when it was at the Science Museum of Minnesota. I did learn a lot and yes, the casts were hard to view. I have enojoyed YA historical fictions. Good freview. To answer your bookaway question, as I want to toss my hat into it, I have not read about Ancient Italy from what I can remember, but I have recently read about Ancient Egypt? I am still thinking about the time I spent inside Stephanie Thornton's novel "Daughter of the Gods" because I quite literally felt as though I have walked through an invisible portal and drank in the world not as it was writ, but as it was originally lived. I love finding authors who can transport us mind, body, and soul into the historical past and into the lives of their characters. Thank you for offering this bookaway but more than that, thank you for giving me curiosity and reason to read "Curses and Smoke"! Thank you so much for your kind comments!!! I really appreciate it! I absolutely LOVED Daughter of the Gods by Stephanie Thornton as well as her first book about Theodora. If you haven't read it you should check it out! Thank you for coming by the blog and I look forward to interacting with you more!!! I will check out your blog as well! Kate Quinn's novels set in ancient Rome are amazing! I'm still reading the rest of her books and as of now I've read three and loved each and every one of them. I also got Stephanie Thornton's newest novel "Daughter of the Gods" because I was enthralled with her first one! I highly recommend her work! alto1jr @ hotmail dot com. I am with you! I have read a few books by Kate Quinn and loved each one! I have read both of Stephanie Thornton's books and loved them as well! Okay everyone...the winner of a copy of Curses and Smoke (drumroll please....).....Kim at Time to Read!!! I will be sending an email to Kim right now and she will have 48 hours to respond with her mailing information. If I don't hear back I will pick a new winner. Thanks to everyone who entered and congrats to Kim!! Thank you! I appreciate the giveaway and can't wait to read this one!